Choose from a selection of 17 holiday rentals in Árchez. Use the search form to the left to filter the results and pick your choice of self catering accommodation in Árchez. We have a good selection of holiday apartments in Árchez perfect for family, single, romantic and group holidays. You may prefer to take a look at our listed holiday villas in Árchez or holiday apartments in Árchez. Find your holiday homes by a specific type using the property type drop down in the filter. Filter the holiday homes in Árchez by a specific area using the area list above. This holiday house has a delightful covered terrace which is located right next to the magnificent pool. 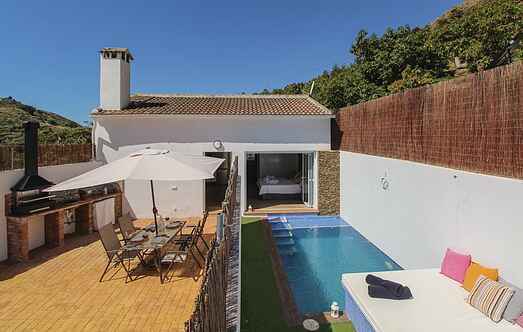 This recently built Spanish villa is the ideal location for a romantic getaway with a partner. Corumbela is a small, quiet village in the mountains of the beautiful province of Málaga. This cosy house has a beautiful covered porch with elegant arcades and a great pool. You can enjoy a well-deserved siesta under the shade of lemon trees. This beautiful holiday home is the ideal place to spend a relaxing holiday. The small town of Algarrobo is surrounded by avocado, orange, olive trees and vineyards. This house is located on the mountain slopes in the Axarquia region of Andalusia. A short walk of less than 10 minutes will take you to the village of Corumbela.